It’s about time that I share with you all a little secret. The situation in the markets is much worse than you realize. While that may sound like someone who has been crying “wolf” for the past several years, in all honesty, the public has no idea just how dire our present situation has become. I really wish that were true. Believe me, when I say this, I am not rooting for a collapse or breakdown of our economic and financial markets. However, the information, data, and facts that I have come across suggest that the U.S. and global economy will hit a brick wall within the next few years. To put out the original information in my articles and reports, I spend a great deal of time researching the internet on official websites, alternative media outlets, and various blogs. Some of the blogs that I read, I find more interesting information in the comment section than in the article. For example, the Peakoilbarrel.com site is visited by a lot of engineers and geologists in the oil and gas industry. Their comments provide important “on-hands insight” in the energy sector not found on the Mainstream Media. I also have a lot of contacts in the various industries that either forward information via email or share during phone conversations. Some of the information that I receive from these contacts, I include in my articles and reports. However, there is a good bit of information that I can’t share, because it was done with the understanding that I would not reveal the source or intelligence. Of course, some readers may find that a bit cryptic, but it’s the truth. Individuals have contacted me from all over the world and in different levels of industry and business. Some people are the working staff who understand th reality taking place in the plant or field, while others are higher ranking officers. Even though I have been receiving this sort of contact for the past 4-5 years, the number has increased significantly over the past year and a half. That being said, these individuals contacted me after coming across my site because they wanted to share valuable information and their insight of what was going on in their respective industires. The common theme from most of these contacts was…. GOSH STEVE, IT’S MUCH WORSE THAN YOU REALIZE. Yes, that is what I heard over and over again. If my readers and followers believe I am overly pessimistic or cynical, your hair will stand up on your neck if you knew just how bad the situation was BEHIND THE SCENES. ..... so far in 2017 there has been $1.96 trillion of central bank purchases of financial assets in 2017 alone, as central bank balance sheets have grown by $11.26 trillion since Lehman to $15.6 trillion. What is interesting about the nearly $2 trillion in Central Bank purchases so far in 2017, is that the average for each year was only $1.5 trillion. We can plainly see that the Central Banks had to ramp up asset purchases as the Ponzi Scheme seems to be getting out of hand. So, how bad is the current economic and financial situation in the world today? If we take a look at the chart in the next section, it may give you a clue. It seems like a lot of people already forgot about the gut-wrenching 2008-2009 economic and financial crash. During the U.S. Banking collapse, two of the country’s largest investment banks, Lehman Brothers, and Bear Stearns went belly up. Lehman Brothers was founded in 1850 and Bear Stearns in 1923. In just one year, both of those top Wall Street Investment Banks ceased to exist. As Bear Stearns added more and more crappy MBS – Mortgage Backed Securities to its portfolio, the company share price rose towards the heavens. At the beginning of 2007 and the peak of the U.S. housing boom, Bear Stearns stock price hit a record $171. Unfortunately, at some point, all highly leveraged garbage assets or Ponzi Schemes come to an end. While the PARTY LIFE at Bear Stearns lasted for quite a while, DEATH came suddenly. Thanks to Jim, many investors took his advice. So, what happened to Bear Stearns after Jim Cramer gave the company a clean bill of health? On Tuesday, March 11, the price of Bear Stearns was trading at $60, but five days later it was down 85%. The source (linked above) where I found the quote in which Jim Cramer provided his financial advice, said that there was a chance Jim was replying to the person in regards to the money he had deposited in the bank and not as an investment. However, Jim was not clear in stating whether he was talking about bank deposits or the company health and stock price. 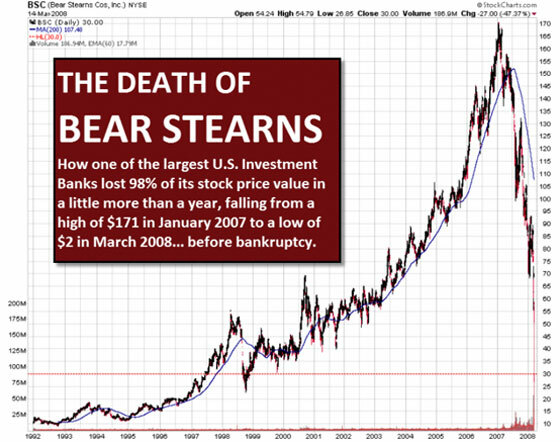 Regardless, Bear Stearns stock price was worth ZERO many years before it collapsed in 2008. If financial analysts had seriously looked into the fundamentals in the Mortgage Backed Security market and the bank’s financial balance sheet several years before 2008, they would have realized Bear Stearns was rotten to the core. But, this is the way of Wall Street and Central Banks. Everything is fine, until the day it isn’t. And that day is close at hand. 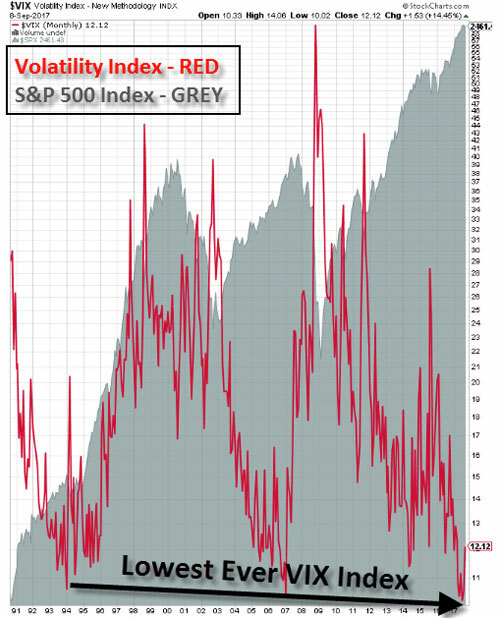 The VIX – Volatility Index (RED) is shown to be at its lowest level ever when compared to the S&P 500 Index (GREY) which is at its all-time high. If we take a look at the VIX Index in 2007, it fell to another extreme low right at the same time Bear Stearns stock price reached a new record high of $171. Isn’t that a neat coincidence? As a reminder, the VIX Index measures the amount of fear in the markets. When the VIX Index is at a low, the market believes everything is A-OKAY. However, when the VIX surges higher, then it means that fear and panic have over-taken investment sentiment, as blood runs in the streets. As the Fed and Central Banks continue playing the game of Monopoly with Trillions of Dollars of money printing and asset purchases, the party won’t last for long as DEATH comes to all highly leveraged garbage assets and Ponzi Schemes. To get an idea just how much worse the situation has become than we realize, let’s take a look at the energy fundamental that is gutting everything in its path. Even though I belong to the Alternative Media Community, I am amazed at the lack of understanding by most of the precious metals analysts when it comes to energy. While I respect what many of these gold and silver analysts have to say, they exclude the most important factor in their forecasts. This critical factor is the Falling EROI – Energy Returned On Investment. As I mentioned earlier in the article, I speak to many people on the phone from various industries. Yesterday, I was fortunate enough to chat with Bedford Hill of the Hill’s Group for over 90 minutes. What an interesting conversation. Ole Bedford knows we are toast. Unfortunately, only 0.01% of the population may understand the details of the Hill’s Group work. The Hill’s Group is an association of consulting engineers and professional project managers. Our goal is to support our clients by providing them with the most relevant, and up to-date skill sets needed to manage their organizations. Depletion: A determination for the world’s petroleum reserve provides organizational long range planners, and policy makers with the essential information they will need in today’s rapidly changing environment. I asked Bedford if he agreed with me that the hyperinflationary collapse of Venezuela was due to the falling oil price rather than its corrupt Communist Government. He concurred. Bedford stated that the total BTU energy cost to extract Venezuela’s heavy oil was higher than the BTU’s the market could afford. Bedford went on to say that when the oil price was at $80, Venezuela could still make enough profit to continue running its inefficient, corrupt government. However, now that the price of oil is trading below $50, it’s gutting the entire Venezuelan economy. Bedford along with a group of engineers spent thousands and thousands of hours inputting the data that produced the “ETP Cost Curve” (BLACK LINE). The ETP Cost Curve is the average cost to produce oil by the industry. The RED dots represent the actual average annual West Texas Oil price. 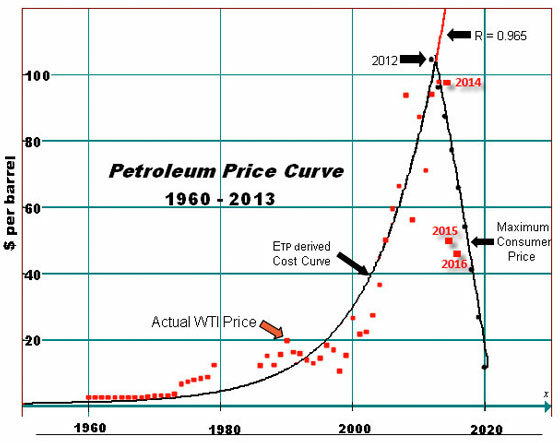 As you can see, the oil price corresponded with the ETP Cost Curve. This correlation suggests that the market price of oil is determined by its cost of production, rather than supply and demand market forces. The ETP Cost Curve goes up until it reached an inflection point in 2012… then IT PEAKED. The black line coming down on the right-hand side of the chart represents “Maximum Consumer Price.” This line is the maximum price that the end consumer can afford. Again, it has nothing to do with supply and demand rather, it has everything to do with the cost of production and the remaining net energy in the barrel of oil. I decided to add the RED dots for years 2014-2016. These additional annual oil price figures remain in or near the Maximum Consumer Price line. According to Bedford, the oil price will continue lower by 2020. However, the actual annual oil price in 2015 and 2016 was much lower than the estimated figures Bedford, and his group had calculated. Thus, we could see some volatility in the price over the next few years. Regardless, the oil price trend will be lower. And as the oil price continues to fall, it will gut the U.S. and global oil industry. There is nothing the Fed and Central Banks can do to stop it. Yes, it’s true that the U.S. government could step in and bail out the U.S. shale oil industry, but this would not be a long-term solution. I have published this graph at least five times in my articles, but it is essential to understand. 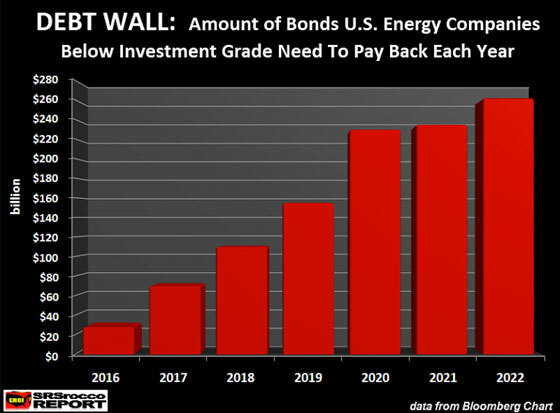 This chart represents the amount of below investment grade debt due by the U.S. energy industry each year. Not only does this debt rise to $200 billion by 2020, but it also represents that the quality of oil produced by the mighty U.S. shale oil industry WAS UNECONOMICAL even at $100 a barrel. Furthermore, this massive amount of debt came from the stored economic energy via the various investors who provided the U.S. shale energy industry with the funds to continue producing oil at a loss. We must remember, INVESTMENT is stored economic energy. Thus, pension plans, mutual funds, insurance funds, etc., had taken investments gained over the years and gave it to the lousy U.S. shale oil industry for a short-term high yield. Okay, this is very important to understand. Don’t look at those bars in the chart above as money or debt, rather look at them as energy. If you can do that, you will understand the terrible predicament we are facing. Years ago, these large investors saved up capital that came from burning energy. They took this stored economic energy (capital) and gave it to the U.S. shale oil industry. Without that capital, the U.S. shale oil industry would have gone belly up years ago. So, what does that mean? It means… IT TOOK MORE ENERGY TO PRODUCE THE SHALE OIL than was DELIVERED TO THE MARKET. Regrettably, the overwhelming majority of shale oil debt will never be repaid. As the oil price continues to head lower, the supposed shale oil break-even price will be crushed. Without profits, debts pile up even higher. For all my followers who believe business, as usual, will continue for another 2-3 decades, YOU HAVE BEEN WARNED. The energy situation is in far worse shape than you can imagine. If you want to lose all your money (most of it), I suggest that you keep it invested in most STOCKS, BONDS and REAL ESTATE. I still receive emails from individuals who try to convince me that real estate is a safe-haven during economic distress. Yes, real estate was good to own in the past, but we are living in much different times today. Years after the markets finally crack, I see thousands and thousands of suburban homes, commercial and industrial properties empty… never to be used again. We just won’t have the energy to run them. Thus, there will be Trillions of Dollars of sunk investment capital gone forever. So, if you are still watching late night infomercials on how to become RICH buying Real Estate, you have my sympathies. Lastly, if you are one of the few Americans not suffering from BRAIN DAMAGE, I suggest that you consider owning some physical precious metals to protect your wealth. Once the markets finally implode, there will be few bids for most STOCKS, BONDS and REAL ESTATE. The time to get out of highly-inflated garbage assets is before everyone else tries to.